Nylon inert thermoplastic polymer natural flavor. Bristle-like projections will be raised during chewing. These projections will help to clean the puppy s new teeth and massage the gums at the same time. Inspect often for signs of wear. 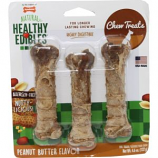 Nylabone - Puppy Teething Keys - Large product is categorised under Wholesale Nylabone Products, PA products, Wholesale Dog Products, Wholesale Toys, Wholesale Chew Toys.